We read with interest the article by Breuil et al discussing Erdheim-Chester disease.1 We report on another man with this rare form of histiocytosis, who showed the unusual features of premature atherosclerosis and a pseudo-malignant phase. A 42 year old man presented to the rheumatology department with a two year history of arthralgia of the knees and ankles. Past medical history included myocardial infarctions at the ages of 33 and 40, with coronary artery bypass grafting at age 39. His father had died of myocardial infarction aged 54. The patient was noted to have xanthomata. Examination of his joints was normal. Laboratory tests, including erythrocyte sedimentation rate, red and white blood cell count, glucose, renal, and liver function tests, were normal. Serum cholesterol was raised at 7.8 mmol/l. Radiographs showed no abnormality of the joints, but demonstrated sclerosis of the distal femora and proximal tibia. Computed tomography (fig 1) and magnetic resonance imaging confirmed sclerosis without osteolysis. Biopsy of the left tibia showed sheets of large foamy histiocytes infiltrating the marrow, confirming the diagnosis of Erdheim-Chester disease. One year later, over a few weeks, he developed a painful swelling in the right mid-thigh associated with low grade fever and weight loss. Repeat blood cultures were negative and no material was aspirated. Radiographs showed a more aggressive appearance with erosion of the cortex, and possible malignant change. A second bone biopsy was performed under general anaesthetic. In the early postoperative period he died of bronchopneumonia and respiratory failure. 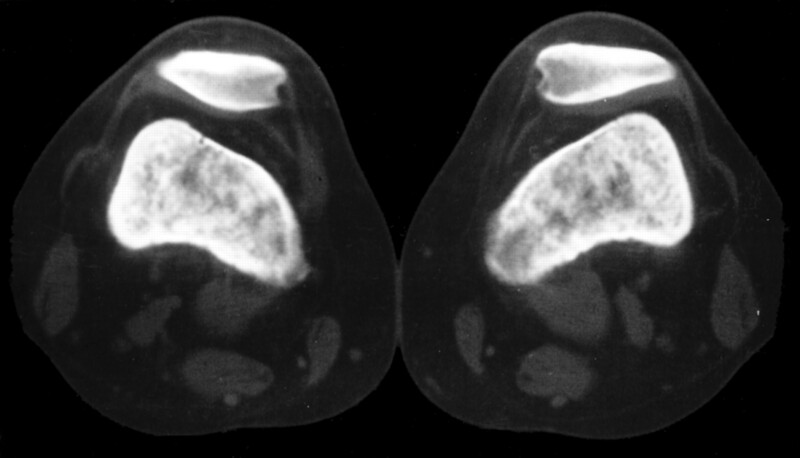 Computed tomography scan showing bilateral osteosclerosis of the femora. At post mortem longitudinal sections of the right femur showed a yellow haemorrhagic infiltrate filling the medullary cavity and eroding the cortex. Histological changes were thickened trabeculae and marrow spaces filled with a mixed inflammatory infiltrate, in which there were numerous lipid laden macrophages. There was erosion of the cortex and the infiltrate extended into the adjacent soft tissues. An oil red O stain for lipid was positive, and there was no malignant change. There were foamy macrophages within the lungs and within the enlarged neck lymph nodes. Breuil V, Brocq O, Pellegrino C, Grimaud A, Euller-Ziegler L. Erdheim-Chester disease: typical radiological bone features for a rare xanthogranulomatosis. Ann Rheum Dis2002;61:99–200. Chester W. Uber lipoidgranulomatose. Virchows Arch Pathol Anat1930;279:561–602. Kenn W, Stabler A, Zachoval R, Zietz C, Raum W, Wittenberg G. Erdheim-Chester disease: a case report and literature review. Eur Radiol1999;9:153–8. Dee P, Westgaard T, Langholm R. Erdheim-Chester disease: case with chronic discharging sinus from bone. AJR Am J Roentgenol1980;134:837–9. Jaffe HL. Gauchers disease and certain other inborn metabolic disorders: Lipid (cholesterol) granulomatosis. In: Metabolic, degenerative and inflammatory disease of bone and joints. Philadelphia: Lea and Febiger, 1972:535–41. Bancroft LW, Berquist TH. Erdheim-Chester disease: radiographic findings in five patients. Skeletal Radiol1998;27:127–32. Shields JA, Karcioglu ZA, Shields CL, Eagle RC, Wong S. Orbital and eyelid involvement with Erdheim-Chester disease. A report of two cases. Arch Ophthalmol1991;109:850–4. Rush WL, Andriko JAW, Galateau-Salle F, Brambilla E, Brambilla C, Ziany-bey I, et al. Pulmonary pathology of Erdheim-Chester disease. Mod Pathol2000;13:747–54.